With lung cancer being the No. 1 cancer killer of women, Rep. Lynda Schlegel Culver (R-Northumberland/Snyder) has sponsored legislation to dedicate the week of May 7-13 as “Women’s Lung Health Week” in Pennsylvania to enhance awareness about the disease. Culver is pictured here with her House colleagues who joined her in recognizing this cause. HARRISBURG – With lung cancer being the No. 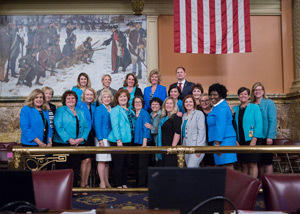 1 cancer killer of women, Rep. Lynda Schlegel Culver (R-Northumberland/Snyder) has sponsored legislation to dedicate the week of May 7-13 as “Women’s Lung Health Week” in Pennsylvania to enhance awareness about the disease. In the United States, a woman learns she has lung cancer every five minutes. Fewer than half of all women diagnosed with lung cancer will be alive one year after their diagnosis. For more information about this resolution, or any other state-related issue, contact Culver’s district office in Sunbury located at 106 Arch St., by calling 570-286-5885, or toll-free at 1-800-924-9060. Information can also be found online at LyndaCulver.com or Facebook.com/RepCulver.